Bubble and Squeak is a traditional English dish similar to the Irish equivalent of Colcannon. It's basically made with a bunch of leftover vegetables one has lying around. Say you were to lose power and have a bunch of vegetables doomed for the garbage can. Let's also pretend, just for fun, that St. Patrick's day was just around the corner. What more perfect dish could there be to make? Supposedly bubble and squeak gets its name from the sound it makes in the pan. I think it would be unusual to come up with this name for it since it neither bubbles nor squeaks in the pan from my experience. In some parts it is referred to as bubble and scrape which is at least half right since the dish does require some deal of scraping with a spatula or spoon. 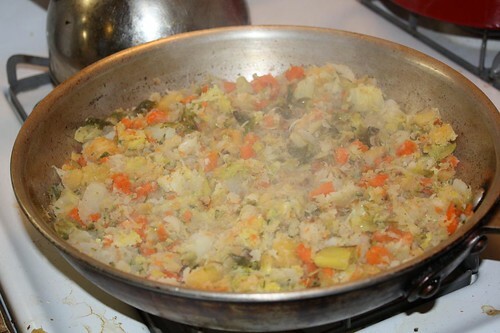 I made this version of bubble and squeak by boiling some leeks, carrots, brussel sprouts, potatoes, rutabaga, and turnip in salted water, straining, then mashing it lightly and browning in a pan with some olive oil and butter. I cooked it for about 30 minutes, turning it ever few minutes and added in some fresh rosemary. 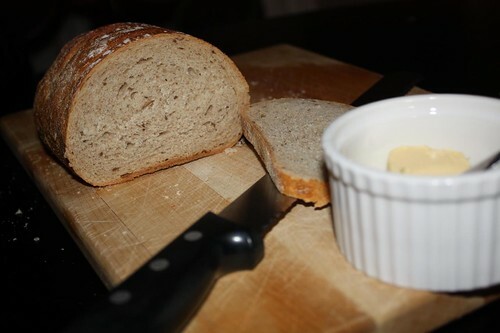 When it was done I served served it with some seeded carraway bread and more Kerrygold Pure Irish Butter. Then things got a little weird. I had some duBreton ground pork from Quebec and some ham steaks that I was concerned about after the power outage. 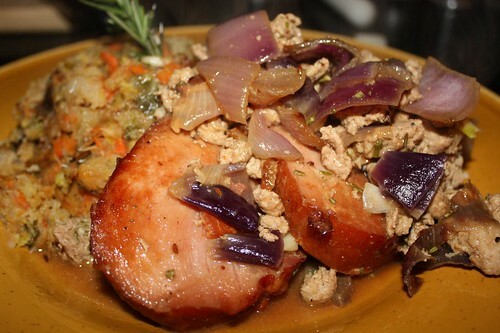 So I rendered a little bacon, cooked up some red onion, then added the ground pork and ham steaks and cooked them with some cayenne and crushed, toasted carraway seeds. After dinner I had a few sips of the Jameson which we'd used to soak the raisins in on Saturday night. 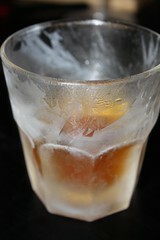 After soaking the raisins I'd put the leftover whiskey in the freezer. The raisins didn't really lend all that much flavor to the whiskey having only macerated for about thirty minutes but the whiskey was still fairly tasty. Tonight I enjoyed leftovers and prepared myself mentally for tomorrow's St. Patrick's Day dinner which will feature a lot of completely Americanized traditions that will be completely unrecognizable to any Irish person outside of the United States. That's how we do it -- American style!